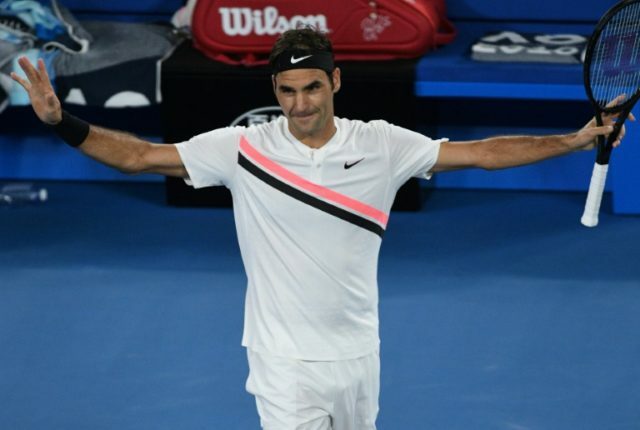 Melbourne (AFP) – Roger Federer says he is regaining the rhythm and consistency of his silky serve following his recovery from a back injury as he steps up the defence of his Australian Open title. The Swiss maestro moved into the last 16 with a commanding straight sets win over Frenchman Richard Gasquet on Saturday with his serving game a feature. Federer was struck down with back trouble last year when he lost to Alexander Zverev in the final of the Montreal Masters and subsequently withdrew from the Cincinnati Masters. But on the evidence of his form in the year’s opening Grand Slam in Melbourne, he looks to be back to his serving best. The 36-year-old said the renewed freedom in his back was contributing to the improvement in his serving. “Just the back being fine again,” Federer said after beating Gasquet. “The problem is, when you have back issues, when you’re scared or you don’t have the confidence in your body. “It robs you by of say 20 or 30 percent of your capabilities maybe on that particular shot only, but it’s enough to make you almost half the player that you normally are. Federer said serving consistency was a big thing in top-level tennis of fine margins between players. “Can you serve like this for five hours? That’s the goal. When you’re carrying an injury, clearly it’s tougher,” he said. “I think right now I’m fine again. Look, bad backs always come and go I think for all of us players. Federer enters the second week of the Australian Open with a round of 16 encounter against erstwhile training partner, Hungary’s Marton Fucsovics.